1.) Coco Chanel’s Little Black Dress. This dress was iconic during the 1920s. 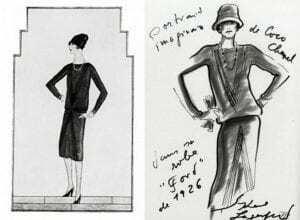 In 1926, American Vogue published an illustration of Chanel’s little black dress. This dress was compares to the Ford car, stating that it would end up in every woman’s wardrobe. The La Garconne look is something that really captures my attention. In fact, Coco cut her hair short because it annoyed her, this resulted in the equally short hemlines on her garments. This laid out the foundation of the Garconne look. This photo is also the epitome of the Garconne look, and I love the Garconne look because it gives women a voice and is a symbol of power. 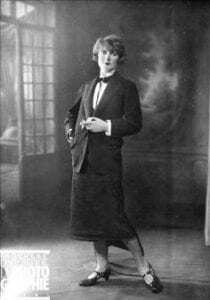 Chanel’s aesthetic was based on her own boyish style. I like this photo because there are a lot of aspects in it that my personal style can relate to. The blazer that she is wearing is tailor-made to her body, resulting in such a nice fit. I also like wearing blazers because it does make one feel powerful. The La Garconne look symbolizes power. I like the aesthetic because it is simple yet classy. 3.) 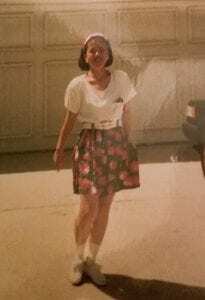 My mom in kankun in 1995. 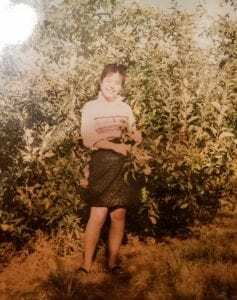 I really like this photo because of the clothes that my mom is wearing. She is wearing a red button down shirt tucked in a printed skirt. 4.) My mom in her driveway in 1991. She is wearing a white shirt with a cherry printed skirt complimented by a white leather belt. I really like this image because it really captures the essence of the style back then. High-wasited skirts fastened with belts and accessories such as headbands or hats were worn. 5.) 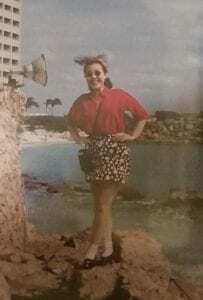 My mom in 1989. It looks as if she is wearing a denim skirt with some printed button down shirt. I feel as if my mother shows some characteristics about the Garconne look.